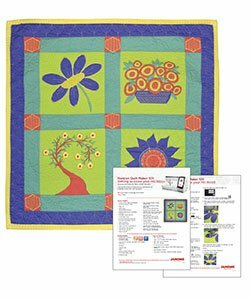 Get to know the advanced and exclusive features of your new Quilt Maker 15000! This 25” x 25” pre-printed cotton panel is set up for you to sit down and sew! The full color, 12 page books walks you through features like AcuFil, Variable Zig Zag Stitches, AcuFeed Flex, and even several apps! Open the package a beginner, and finish your quilt as an expert on this machine!